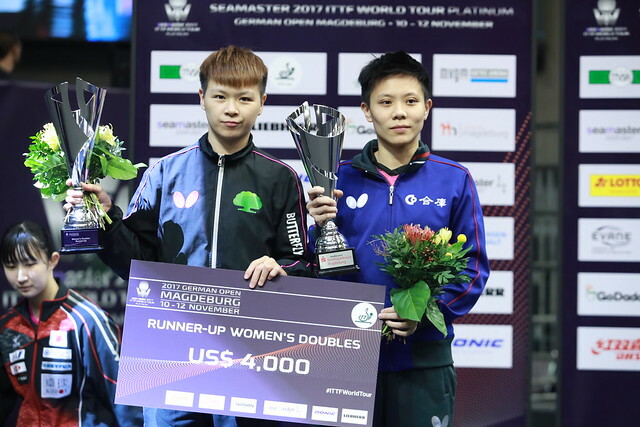 Zhu Yuling, the top seed, alongside Chen Meng, the name next in the order of merit emerged successful in the second round of the Women’s Singles event at the Seamaster 2017 ITTF World Tour Platinum German Open in Magdeburg on the evening of Friday 10th November, as China imposed its authority on proceedings. Additionally, in the top half of the draw Wang Manyu and Wu Yang both emerged successful, as in the lower half did Feng Yalan and Chen Ke. Impressively, Zhu Yuling beat compatriot and qualifier, Liu Xi (11-7, 11-5, 11-7, 13-11); Chen Meng overcame Japan’s Hitomi Sato, the no.10 seed (11-6, 11-3, 11-9, 5-11, 12-10). Comfortable wins for Zhu Yuling and for Chen Meng; for Feng Yalan, likewise there was no great drama. She overcame fellow qualifier, Hong Kong’s Doo Hoi Kem in five games (13-11, 7-11, 11-7, 12-10, 11-9). However, for Wu Yang, Wang Manyu and Chen Ke, life was more exacting; all three faced colleagues who had emerged successful in the qualification tournament. Wu Yang, the no.12 seed, needed six games beat colleague Sheng Dandan (9-11, 11-8, 11-9, 9-11, 11-5, 11-8), Chen Ke, also a qualifier, required the full seven to overcome Li Xiaodan (11-3, 6-11, 11-7, 11-8, 6-11, 9-11, 11-6). Close for Chen Ke, it was even closer for Wang Manyu, the no.8 seed; she was stretched to the very limit by Chen Xingtong (11-13, 10-12, 11-9, 13-11, 5-11, 11-6, 12-10). Three Chinese players in each half of the draw through to the round of the last eight; standing in the way of a semi-final clean sweep is the Japanese duo of Kasumi Ishikawa and Mima Ito. In the second round of proceedings Mima Ito, the no.5 seed, beat colleague Hina Hayata, the no.13 seed (12-10, 11-8, 15-13, 11-8); Kasumi Ishikawa, the no.3 seed, ended the hopes of Korean qualifier Suh Hyowon (13-11, 11-5, 13-11, 15-17, 11-8). At the quarter-final stage Zhu Yuling meets Wang Manyu, Wu Yang opposes Kasumi Ishikawa in what is a repeat of last year’s final. In the opposite half of the draw it is Feng Yalan versus Mima Ito, Chen Ke in opposition to Chen Meng. The quarter-final matches will be played on Saturday 11th November.